Geoffrey Howard Perkins (22 February 1953 – 29 August 2008) was a British comedy producer, writer and performer. Best known as the BBC head of comedy (1995–2001), he produced the first two radio series of The Hitchhiker's Guide to the Galaxy and is one of the people credited with creating the bizarre panel game Mornington Crescent for I'm Sorry I Haven't a Clue. In December 2008 he posthumously received an Outstanding Contribution to Comedy Award. 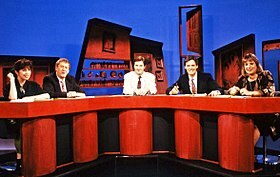 Perkins attended the Harrow County Grammar School, alongside Nigel Sheinwald, Michael Portillo and Clive Anderson, with whom he ran the debating society. Taking an early interest in drama, in 1970 he worked with Clive Anderson to write a charity revue called Happy Poison. Perkins read English at Lincoln College, Oxford and while there wrote for and directed The Oxford Revues of 1974 and 1975. After his time at Oxford, Perkins joined the Ocean Transport and Trading Company, where he was put to work studying waste timber in Liverpool. He did not last long in the field of commercial shipping. In 1977, drawing on his work for the Oxford Revue, Perkins joined "BBC Radio's light entertainment department [alongside] Cambridge graduates such as John Lloyd and Griff Rhys Jones. Tasked by department head David Hatch, Perkins helped to revitalise the comedy panel show I'm Sorry I Haven't a Clue (launched five years earlier), introducing the incomprehensible Mornington Crescent game which would become an enduring success. "The intellectuals compared it to Swift, and the 14-year-olds enjoyed hearing depressed robots clanking around." Perkins produced the first series of Douglas Adams' The Hitchhiker's Guide to the Galaxy in 1977 for BBC Radio 4, taking over from pilot-producer Simon Brett. Perkins assisted the notoriously slow writer in finishing the scripts, before John Lloyd was drafted in to write large sections of the later episodes. Perkins also drew on the resources of the Radiophonic Workshop to help create the groundbreaking audio effects for the series. In 1986, Perkins married Lisa Braun, who was BBC studio manager on Hitchhiker's Guide. In 1980, Perkins co-wrote and featured in the radio sketch show Radio Active, revised and adapted from the early Oxford Revue shows, and initially based around the comedy parody group The Hee Bee Gee Bees, consisting of Philip Pope, Angus Deayton and Michael Fenton Stevens. Prior to its leap from the revue to the radio, the production toured and appeared at the Edinburgh Festival Fringe, after which it was picked up by BBC Radio 4 for a pilot called The Oxford Revue Presents Radio Active. Radio Active, "which poked fun at the amateurishness of some local radio broadcasting," went on to run for seven series, and won a Sony Award. Perkins featured as a character called Mike Flex, a young cocky disc jockey. Perkins, with Deayton, wrote much of the series and later saw it transferred to BBC2 television as the Grand Prix and Silver Rose of Montreux-winner KYTV. Perkins, with Radio Active colleague and co-writer Deayton, later produced The Uncyclopaedia of Rock for Capital Radio, winning the Monaco Radio Award for the show, and penning a 1987 tie-in book with Deayton and Jeremy Pascall. In 2005 he cameoed in the fourth radio series of Hitchhiker's (The Quandary Phase), as the producer of the radio show Arthur Dent worked on. Essentially playing a fictional version of himself from the first series with a fictional version of writer Douglas Adams. Perkins left the BBC in 1988, to become a director of Hat Trick Productions, an independent television and radio production company. Hat Trick's produced comedy programmes for the BBC, ITV and Channel 4. The first main production of Perkins was Spitting Image where he met Ben Elton, and Harry Enfield whom he got to develop the character of Douglas Hurd by suggesting he adapt it along the lines of Frank Oz's character Fozzie Bear. As a result, Perkins developed shows for both performers, in the form of Elton's hosted Saturday Live and sketch show The Man From Auntie; and Enfield's Harry Enfield's Television Programme. 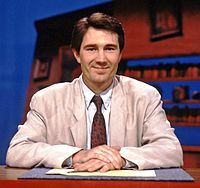 Perkins also developed Have I Got News For You, Whose Line Is It Anyway?, Drop The Dead Donkey and Father Ted for Hat Trick, many of which won awards including Baftas. The last show Perkins script edited for Tiger Aspect was The Fast Show. In 1995, he resigned from Hat Trick and returned to the BBC as BBC Television's Head of Comedy, requesting his contract stipulated "his continued role as a programme producer," as well as overseeing the department. He stayed in this role until 2001, growing increasingly dissatisfied at "official BBC snootiness about comedy". "Unfortunately, the term sitcom implies a great disdain. People say it with a curl of their lips." Under Director General John Birt, Perkins also felt "hamstrung by the inevitable bureaucracy," which not only hindered programme-making, but saw Perkins spending "more time on budgets" than more creative pursuits. “ set the people that produce programmes in direct opposition to the people responsible for actually paying for and broadcasting them. There have been occasions when you say, 'Let's just make a deal', knowing everyone is unhappy; where no one gets the budget they want to make their programme. There are people who are inspired by that, but I'm not one of them. During Perkins' time as Head of Comedy, the BBC produced such hits including Coupling, The Thin Blue Line, Jonathan Creek, The Fast Show, The Royle Family and My Family. Perkins also persuaded David Jason and Nicholas Lyndhurst to star in a new series of Only Fools and Horses, the first of which was screened at Christmas 2001. Having left the BBC, Perkins became a creative director and executive producer for independent production company Tiger Aspect in late 2001. In this role, he was able to pursue a more hands-on role in the "creative side of programme-making." For Tiger Aspect, Perkins produced programmes including The Catherine Tate Show for the BBC, and Benidorm for ITV. Perkins' writing credits for television include The World According To Smith & Jones, KYTV, Harry Enfield's Television Programme, Harry Enfield and Chums and Coogan's Run. In addition to starring in KYTV, Perkins appeared in small cameo roles in several of the comedy programmes he produced, including Father Ted, Operation Good Guys, One Foot in the Grave and The Catherine Tate Show. He also hosted the panel game Don't Quote Me, made by Open Media for Channel 4 in 1990. In 2006, Harry Enfield was told by Controller of BBC One Peter Fincham that he was too old to make another comedy sketch series. Enfield approached Perkins with his ideas, which Perkins helped Enfield develop into the first series of Harry and Paul, starring Enfield and Paul Whitehouse, shown in April 2007. Perkins died on 29 August 2008 and was initially thought to have died from injuries after an accident involving a lorry in Marylebone High Street, London. However, a coroner's inquest in April 2009 determined that Perkins had suffered from an undiagnosed case of channelopathies, which caused his heart to stop suddenly. The jury decided that Perkins had likely already died when he fell under the wheels of the lorry, and the coroner recorded that he died from "natural causes". On 5 September 2008 Perkins' last production for the BBC and Tiger Aspect – the second series of the re-titled Harry and Paul – was broadcast, a week after his death. The first episode was dedicated to his memory, and instead of the usual closing credits, featured a short tribute to him and concluded with an out-take of Perkins forgetting his lines in a sketch absent from the transmitted series. On 8 November 2008, BBC Two aired an evening of programmes in tribute to Perkins, comprising episodes of The Catherine Tate Show, Father Ted (a Channel 4 programme which the BBC was given special permission to broadcast as part of the tribute) and The Fast Show, together with a special edition of Comedy Connections about Perkins' career in comedy. He was posthumously awarded the Outstanding Contribution to Comedy award at the British Comedy Awards on 6 December 2008. The recipients of both the BAFTAs awarded on 27 April 2009 to Harry and Paul for Best Comedy Programme and to The IT Crowd for Best Situation Comedy dedicated their awards to Perkins. ^ a b c d e f g h i j k l m n o p q r s t u v w x y z "Geoffrey Perkins obituary". Telegraph. 31 August 2008. Retrieved 13 December 2013. ^ a b James Rampton (19 December 1995). "Media: Serious about funny business". The Independent. Retrieved 13 December 2013. ^ "Radio Active Remembered". Radioandtelly.co.uk. Retrieved 13 December 2013. ^ Comedy executive killed in road accident The Daily Telegraph, 29 August 2008. ^ "Comedy producer dies in accident", BBC News Online, 29 August 2008. ^ Burns, Janice (17 April 2009). "TV comedy guru Geoffey Perkins was killed by heart attack, probe told". Daily Record (Scottish Record and Sunday Mail). ^ Gray, Sadie (7 December 2008). "Brand is a winner and Ross a loser on comedy's big night". The Independent. Retrieved 13 December 2013. This page was last edited on 15 March 2019, at 15:11 (UTC).